Georgia native Gabriela Díaz began her musical training at the age of five, studying piano with her mother, and the next year, violin with her father. 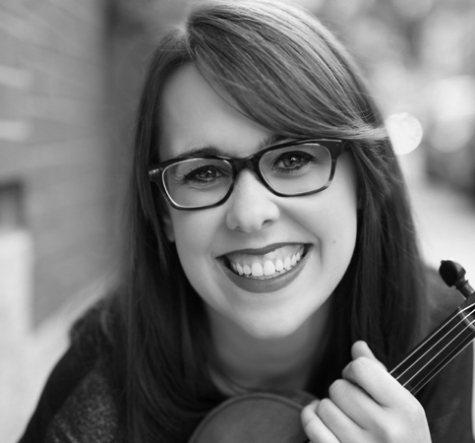 Gabriela graduated with honors from New England Conservatory, receiving Bachelor and Master’s degrees in violin as a student of James Buswell; at NEC, she received the George W. Chadwick Medal, the highest undergraduate award, and the John Cage Award for commitment to contemporary music. As a cancer survivor, Gabriela is committed to supporting cancer research and treatment in her capacity as a musician. In 2004, Gabriela was a recipient of a grant from the Albert Schweitzer Foundation, an award that enabled Gabriela to create and direct the Boston Hope Ensemble. A firm believer in the healing properties of music, Gabriela and her colleagues have performed in cancer units in Boston hospitals and presented benefit concerts for cancer research organizations in numerous venues. A fierce champion of contemporary music, Gabriela has been fortunate to work closely with many significant composers on their own compositions, namely Pierre Boulez, Magnus Lindberg, Frederic Rzewski, Alvin Lucier, John Zorn, Roger Reynolds, Steve Reich, Brian Ferneyhough, and Helmut Lachenmann. Gabriela is a member of several Boston-area contemporary music groups, including Sound Icon, Ludovico Ensemble, Dinosuar Annex, Firebird Ensemble, Boston Musica Viva, and Callithumpian Consort. She also plays regularly with Winsor Music, Mistral Music, Radius Ensemble, and Emmanuel Music. In 2012 Gabriela joined the violin faculty of Wellesley College. Highlights of the 2015-16 season include recording Roger Reynolds’ solo work, “Kokoro,” performing Ken Ueno’s violin concerto, Zetsu, and a performance of Pierre Boulez’s Anthemes 2. Gabriela can be heard on New World, Centaur, BMOPSound, Mode, Naxos, and Tzadik records. Gabriela plays on a Vuillaume violin generously on loan from Mark Ptashne and a viola made by her father, Manuel Díaz.